Yamaha R15 is currently available in India in its second generation. The first generation motorcycle was discontinued few years back and gave way to the SuperSport inspired R15 V2.0 in India. Yamaha relaunched the Version 1.0 inspired R15S in India in order to keep the other customers that needed a single long seat happy. The first generation Yamaha R15 was powered by the same engine as the current generation model but weighed considerably less at 131 kg. It came with just 80/90-17 and 100/80-17 inch tyres. R15 Version 2.0 comes with better tyres (90/80-17 and 130/70-17) and even got itself a new exhaust from the first version. The rear end witnessed a huge raise and that made it uncomfortable for the pillion in most conditions. The fuel tank remained same on both the versions. The 149.8 cc, single cylinder engine on the motorcycle is good for 16.8 BHP and 15 Nm of torque. The gearbox remains 6-speed while the bike weighs 136 kg. The front and rear disc remains unchanged from the R15 v1.0. Yamaha R15 v3.0 will launch in India around the last quarter of 2017. It is undoubtedly the most advanced R15 ever, carrying new features like USD front forks, Variable Valve Actuation (VVA), full LED headlight, all-digital instrument console, bigger brakes and an all-new engine. The 155.1 cc engine comes with VVA, producing 19.04 BHP at 10,000 rpm and 14.7 Nm at 8000 rpm. The engine comes mated to a 6-speed gearbox and even uses a fully digital instrument console on the V3.0. It is expected to get a price tag of around INR 1.30-1.35 lakh while three shades will be offered initially. Click here to know more about Yamaha R15 V1. 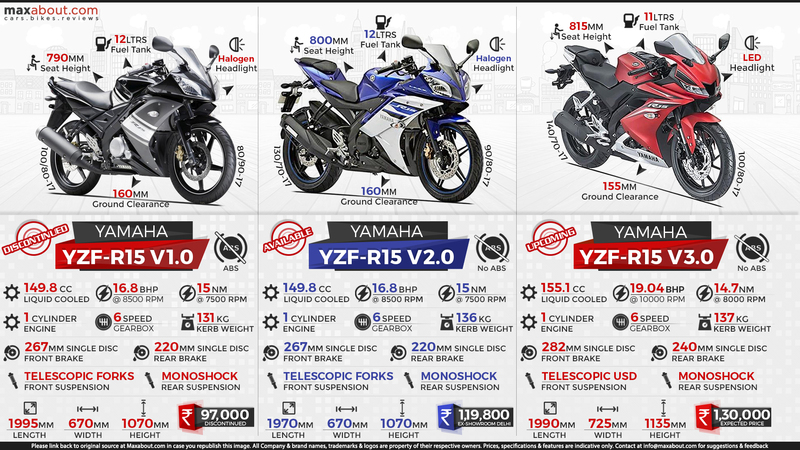 Click here to know more about Yamaha R15 V2. Click here to know more about Yamaha R15 V3. Downloaded 168 times this week.